In a recent study, investigators utilized dynamic contrast enhanced-perfusion imaging (DCE-PI) and ultrasonic molecular imaging (USMI) to gauge response to therapy for pancreatic cancer. 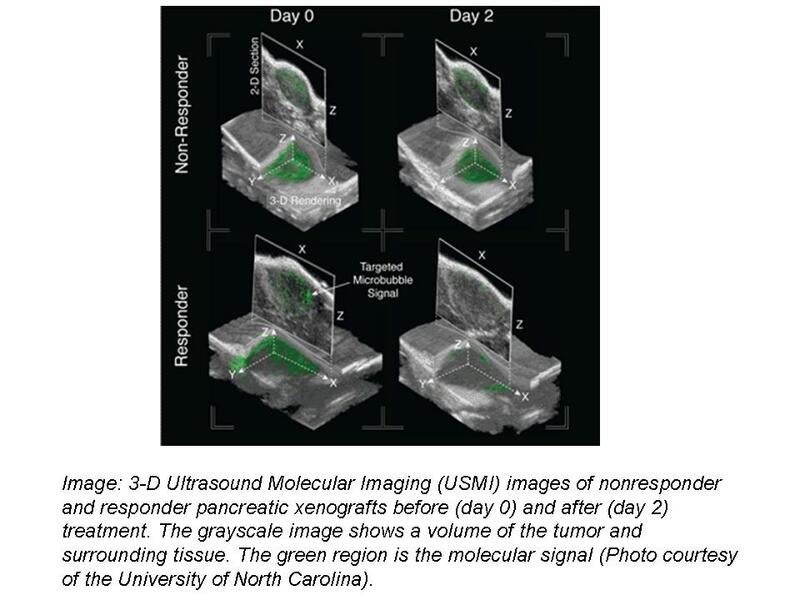 Dr. Dayton, a UNC associate professor of biomedical engineering, worked with Jen Jen Yeh, M.D, an associate professor of surgery and pharmacology, to assess the imaging technologies on human pancreatic cancer in a preclinical model. Both investigators are members of the Lineberger Comprehensive Cancer Center. USMI has the ability to depict noninvasively the biologic processes at the cellular and molecular levels. It accomplishes this with the use of targeted contrast agents, which are markers that bind to specific proteins expressed on cancer cells within the body. These contrast agents enable a conventional ultrasound system to identify signals from cancer cells that would otherwise be undetectable. Ultrasound DCE-PI is a technique used noninvasively to track the blood flow in the microcirculation. Because growing tumors require abnormally increased blood flow, alterations in blood vessel structure or density can provide data regarding tumor malignancy. The researchers employed a drug that suppresses a protein specific to tumors. They then used the imaging applications to gauge the response of two different tumors, one known to respond to the drug therapy, and a second known not to respond. The findings indicated that USMI was able to detect molecular signs of tumor response to therapy after only two days. A change in blood flow in the tumor was seen to detect response after day 14 using DCE-PI. Over the same period, standard volume measurements were not able to detect therapeutic response, and prior studies suggested that volume measurements do not become indicative of response until approximately 28 days. 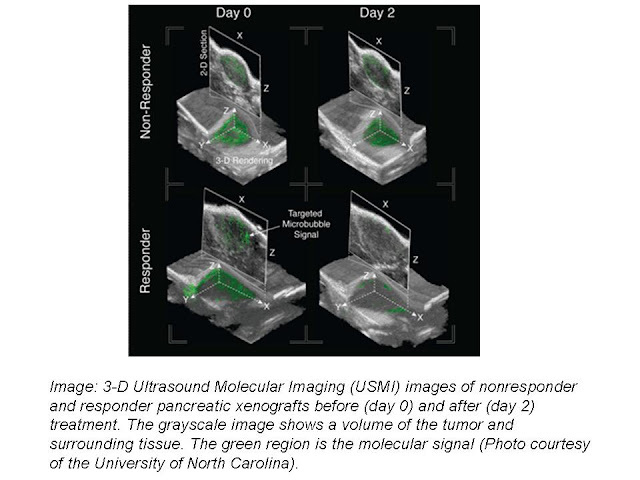 Therefore, these modalities revealed a substantial improvement in the early identification of tumor response to therapy, using contrast enhanced ultrasound imaging. The contrast agents for USMI currently in clinical trials in Europe for cancer imaging, however, they are not yet available in the United States.